Our Gamespace team won the Grand Final game against the SOBR clan in an unusual 2 map grand finale to end the 2008 gaming season for *AUS*, it was a great way to see out the year. With all our teams now locked down or in free play mode for the Christmas break things have been slowing down significantly as people take some leave. News has finally come through for the new large format comp, after a bit of uncertainty the 16v16 ladder is confirmed now a 14v14 Point of Existence 2 Ladder which most of us are looking forward to. Other than that we have a few activities planned to see us through into mid January when things will begin to pick up again for the year that will hopefully reveal the long awaited news of the new Battlefield game, until then, BF2 and its mods will keep us busy im sure. What started out has a bit of fun racing around Karkand one night by a bunch of semi bored *AUS* clan members has grown into a little in house competition and then evolved again into an �invite only� community wide event. 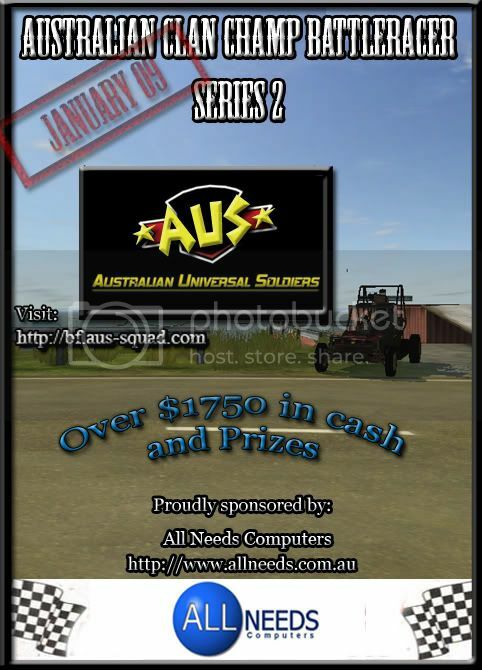 It is a battlefield 2 based racing ladder on the Battleracer mod, hosted here at *AUS* and now sponsored by All Needs Computers who are supporting the comp by putting up cash and prizes for the drivers and teams to race for. We are pleased to announce the second season of the *AUS* Battleracer Championships which will begin in January 2009.If last season is anything to go by, season 2 is bound to be a blast with some exciting new race formats and maps for the drivers to negotiate. The competition is going to be fierce so be sure to check the forums for the team and driver registration procedures. A special thanks goes out to All Needs Computers and the SIR. community, especially Elxx for supporting the comp and making this all possible.